I’m so glad I read The Lone Ranger and Tonto Fistfight in Heaven before watching this movie. I didn’t realize that the film came out of the collection of short stories (most especially the story “This Is What It Means to Say Phoenix, Arizona”), and it added a significant amount of depth to the movie having read those stories. The way all the stories kind of came together to form the world the film takes place in (I’m thinking specifically of the community on the reservation) makes me reconsider the written collection and wonder if it couldn’t be considered a novel written in a non-linear and disjointed form. I mean, the stories are all interrelated, containing the same characters in the same location — why isn’t this classified as a kind of fragmented or fractured narrative, a novel that (similar to Edwidge Danticat’s Dewbreaker) is focalized through different characters in each chapter and touches on different events in the past and/or present of each of their lives. Okay, but to consider the movie on its own terms, I first must admit that I really loved the fellows broadcasting from K-REZ radio (especially Lester Falls-Apart, who sits on top of his broken down van at the intersection and reports on the traffic that has or has not passed). 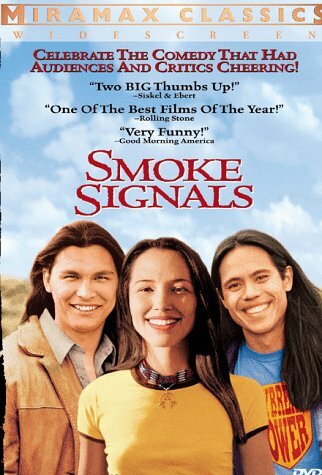 They reminded me of the characters in “The Only Traffic Signal on the Reservation Doesn’t Flash Red Anymore” in their observation of the life that happens around them. And the two women who drive their car in reverse have to have come out of the character Simon from “The Approximate Size of My Favorite Tumor” who “always obeyed posted speed limits, traffic signals and signs, even minute suggestions. But he drove in reverse, using his rearview mirror as his guide” (156). Well, needless to say, characters from the short story collection are sprinkled throughout the film — not always in a readily-recognizable manner. That being said, I think one of the most significant differences between the collection and the film is the general tone. The collection is, well…somewhat less-than-optimistic. On the contrary, the film is quite optimistic. While at the end of “This Is What It Means to Say Phoenix, Arizona” Victor and Thomas realize their relationship ultimately will not change, at the end of the film they appear to be buddies — friends who have put the past behind them and may perhaps develop a deeper friendship now that they’ve shared such profound experiences. In the collection, the many seemingly-unchangeable aspects of life on the reservation that cause pain or unhappiness to the people who live there accumulate and leave the reader with a sense of the weight of these matters. However, in the film these issues are buried beneath the comedy of the events. For example, Thomas Builds-the-Fire is not shunned for his stories, but rewarded for them time after time. Furthermore, Victor’s family does not continue to drink, but instead his mother stops drinking when she sees how it’s affecting him and his father leaves and eventually overcomes his alcoholism. All in all, the film is far more optimistic and positive than the collection of short stories.